The Manitoba government announced it earmarked $250 million for new flood infrastructure in Manitoba. The former emergency flow channel between Lake Manitoba and Lake St. Martin becoming permanent and an additional outlet from Lake Manitoba are included. 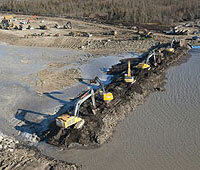 Construction to make the emergency flow channel permanent is scheduled to start in 2016 and be finished by 2021. The Channel carries the waters from these lakes into Lake Winnipeg. The federal government has been informed of Manitoba's intention regarding permanent arrangements to move waters between water basins. Engineers are designing plans for boosting Lake Manitoba outlet capacity. The increase to the Manitoba provincial sales tax will pay for $250 million in flood infrastructure. Due to unprecedented flooding in 2011, an emergency outlet channel was built to drain flood water from Lake Manitoba and Lake St. Martin into Lake Winnipeg. Lake Manitoba drains through the Fairford Channel into Lake St. Martin and Lake St. Martin drains into Lake Winnipeg via the Dauphin River. Additional waters flow into Lake Manitoba when the Portage Diversion is opened during a flood year. Lake St. Martin is shallow and much smaller than Lake Manitoba. Small changes in water level on the big lake cause large changes in water level on the small lake. The longstanding problem grew considerably with construction of the Portage Diversion. Over 800 homes, businesses and farms around Lake Manitoba were flooded in 2011. 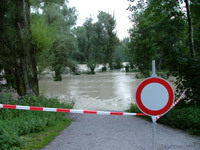 Several First Nations were flooded, with mass evacuations involved. Damages to property, and evacuations from 2011 are ongoing in 2013. Four separate reviews of spring 2011 flooding in Manitoba will be undertaken to determine effectiveness of the flood response and to recommend ways Manitoba can better fight future floods, announced Manitoba Infrastructure and Transportation Minister Steve Ashton February 8, 2012. The 2011 flood review task force chaired by engineer David Farlinger will do the primary review. A second review, chaired by economist and management consultant Harold Westdal, will examine water levels on Lake Manitoba and Lake St. Martin. A third review, to be undertaken by an independent consultant who has yet to be named, will study flood control measures in the entire Lake Manitoba watershed. A fourth study, headed by Dr. Shannon Stunden Bower, will come up with a province-wide plan to better manage water on the land rather than though drainage. The four reviews have a combined budget of $4 million. Both Farlinger and Westdal's reviews are to be done over the next six to nine months. "It is not yet clear from the terms of reference how transparent and participatory the process will be. Many Manitobans have concerns about how 2011 flooding was handled. Manitobans are also knowledgeable about flooding and could inform the task force. Citizen participation should be part of the reviews, and all aspects of the reviews need to be transparent and publicly accessible," said Manitoba Wildlands Director Gaile Whelan Enns, adding "We also note that the Red River Valley and Portage Diversion appear to be omitted from the reviews." Both the opposition Liberals and Progressive Conservatives said the province should have announced an independent review of 2011 flooding in fall 2011. Instead decisions about 2011 floods were being sidetracked * by the Manitoba fall 2011 election campaign.